The Gaudiani Clinic offers in-person and telemedicine care to people with eating disorders and disordered eating across the United States. If you live in a telemedicine compact state (noted in orange below) and wish to see one of our physicians, we are able to obtain licensure in approximately 1-2 weeks. 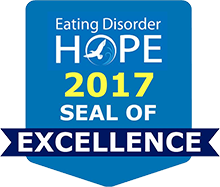 The Gaudiani Clinic understands and appreciates the complexities of eating disorders and the limitations of telemedicine. At the Gaudiani Clinic, we meet with all patients in person for an in-depth meeting and assessment at our beautiful office in Denver, CO, and then create a telemedicine treatment plan when appropriate which involves extensive coordination with the local treatment team. Ongoing virtual/telemedicine care is provided utilizing HIPAA-compliant video conferencing and in-person visits. Prospective patients from outside of our currently licensed states are invited to come to Denver to complete an initial consultation. Additional state licensure will be considered for clients desiring membership.